TOKYO, Dec, 07 2018 - (JCN Newswire) - Fujitsu Laboratories Ltd. and Professor Shingo Takahashi of the Department of Industrial and Management Systems Engineering at Waseda University today announced the development of a new technology that automatically analyzes the factors leading to congestion based on the results of human behavior simulations. Human behavior simulations, which model the behavior of people as "agents" based on their various attributes and goals, are currently used to predict how people behave when evacuating during emergencies or to review the flow of people in urban planning. As a subset of these simulations, experts use the results of large numbers of congestion prediction simulations to analyze the root causes of congestion, but there have been issues with this process because the simulations must be evaluated one by one, which not only takes a great deal of time, but may also lead researchers to overlook some potential causes. Now, Fujitsu Laboratories and Professor Takahashi have developed a technology to discover the causes of congestion. The new technology groups categories that have a certain degree of commonality, and expresses the characteristics of respective agents in a small number of combination categories, without listing the results of movements and routes of tens or hundreds of thousands of agents individually through simulation-based modeling. This approach makes it easier to extract characteristics of agents linked to the causes of congestion, while enabling the creation of measures appropriate to their particular attributes and movement patterns. This technology enables a quick evaluation of measures to ameliorate congestion in commercial facilities, event venues and other locations that deal with congestion due to high attendance or urban centralization, and ultimately contributes to achieving of the goal of improving safety and comfort in society. Aspects of this technology will be detailed at the Winter Simulation Conference (WSC) 2018, an international conference held in Gothenburg, Sweden, beginning December 9. Event spaces, airports, and shopping malls where crowds gather often deal with problems of congestion, which can lead to lower customer satisfaction and sales. Currently, beyond increasing the number of staff assigned to and supporting at places such as entrances, exits, and points of sale, a number of additional methods exist to alleviate congestion. These include installing signs and maps, and diverting people to less crowded spaces or times with incentives such as coupons. In order to implement more effective congestion alleviation measures, however, it is important to understand what types of people will take what types of actions in response to what types of information. To gain such an understanding, "human behavior simulations" are now garnering attention. Such simulations model the attributes, cognition and actions of diverse groups of people as "agents," and with computer-based virtual modeling of congested situations it is possible to analyze causes and evaluate solutions to congestion. Fujitsu Laboratories and Fujitsu Limited have been conducting research for some time on the modeling of agents, which enables highly refined simulation, and they have applied for 16 patents both inside and outside Japan stemming from this research. Additionally, Takahashi Laboratory, Waseda University, has also developed an agent-based simulation for solving various issues involving social systems such as organization systems, consumer behavior, and corporate strategy. In human behavior simulation, the agents may number over several thousand, and each have attributes such as age, gender, and a purpose in visiting a location. The agents refer to information on routes and congestion from sources such as signs, and choose a route to their destination. The action of following that route results in varied levels of congestion in different locations throughout the simulated venue. Conventionally, experts repeat a process of trial and error, analyzing large volumes of data from simulations, proposing hypotheses for the reasons behind congestion and possible countermeasures based on their insight and expertise, and then repeating the simulation to evaluate those hypotheses. Consequently, it might take several months to analyze proposed causes and determine appropriate countermeasures, and in some instances when analysts overlook certain causes there may also be problems finding effective measures to reduce it. Now, Professor Takahashi and Fujitsu Laboratories have developed a new congestion cause discovery technology that can comprehensively extract the characteristics of agents as they relate to congestion. Previously, because data relating to an agent's attributes, cognition, and actions (e.g. the agent's goal being "eating lunch" or the agent having seen a sign at location A), which get expressed in the form of dozens of database entries, would all be combined to form the agent's characteristics, this process would generate a massive number of combinatorial patterns. With this new technology, which creates logical groups that include similarities in traits and generates clusters of agent characteristics for each group, it becomes possible to reduce the number of combinatorial patterns (Figure 2). This enables the discovery of causes that are directly connected to countermeasures, and answers the question of what sort of measures would be effective in changing the cognition or actions of people with specific sets of attributes. 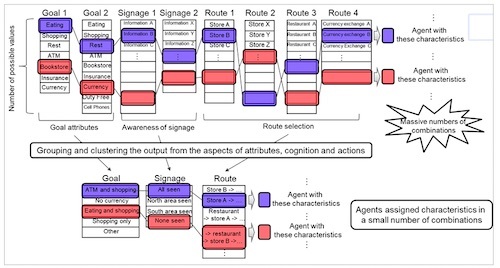 For example, with regard to congestion occurring at store A and store B in a shopping complex, by taking note of "cognition" it could be determined that the congestion in store A was caused by people who had seen signage, and looking at "actions," the congestion in store B was caused by people that finished eating at a restaurant and all came to the store together (Figure 3). This means that the congestion at store A can be effectively dealt with by setting new signage to guide users for other goals, such as use of ATMs, and the congestion at store B could be handled by increasing staff or transaction speed. In 2015, Fujitsu and Professor Takahashi applied this technology to a human behavior simulation developed for analyzing congestion amelioration measures at an airport(1) and evaluated its effectiveness. As a result, they were able to discover about four times as many causes of congestion as analysis by experts. For example, in an analysis of congestion at security screening, the system was able to newly discover that passengers piling up at a specific check-in counter caused sudden congestion at the security screening area. It was confirmed in simulation that implementing measures based on the cause of congestion discovered with this technology would have the effect of reducing the number of people waiting at security by one sixth more than with the measures suggested as a result of expert analysis. On the other hand, the number of staff required for measures would be limited to one third that of the expert's measures. In addition, the time required for this analysis was massively reduced, from several months to a few minutes. 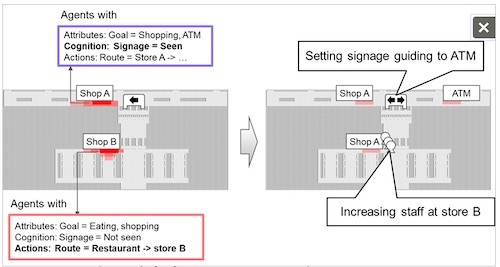 Fujitsu and Waseda University will move forward to conduct field trials using this technology, applying it to congestion at locations like event spaces, airports, and shopping malls, and evaluate its effectiveness, including with such measures as digital signage and the placement of commercial tenants. Fujitsu will also leverage its Human Centric AI Zinrai artificial intelligence and supercomputer technologies, and together with its Fujitsu Technical Computing Solution GREENAGES Citywide Surveillance software, which enables a real-time understanding of urban conditions, will aim to quickly realize a future predictive solution for congestion. Waseda University aims to establish simulation technologies to solve problems, not limited to congestion, by modeling and analyzing complex phenomena in society, markets and organizations, with human behavior included as an essential component.